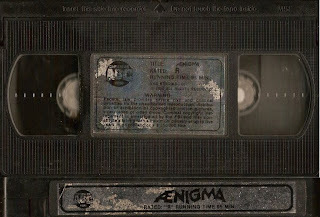 Here's an odd VHS of Lucio Fulci's 1987 Aenigma from "Caribbeam ABC Video". I think it's from Venezuela, but the cassette had one of those annoying "PLEASE REWIND" security stickers on one of its windows like it was rental from somewhere in the states. Check out the Engrish synopsis. Other strange things are how it notes an "R" rating and it has no subtitles of any kind for its English audio. Anyone else have or have anymore info on this tape? I want to see this movie. I'm not even sure if it's on DVD. That "Engrish" synopsis is hilarious. Lol i remember being in the video store with my dad asking him what that was and he would just say "something you can't watch".